Gee's Bend, Alabama, is a small community that's home to a group of quilters who are well known for their innovative designs and bold use of color. 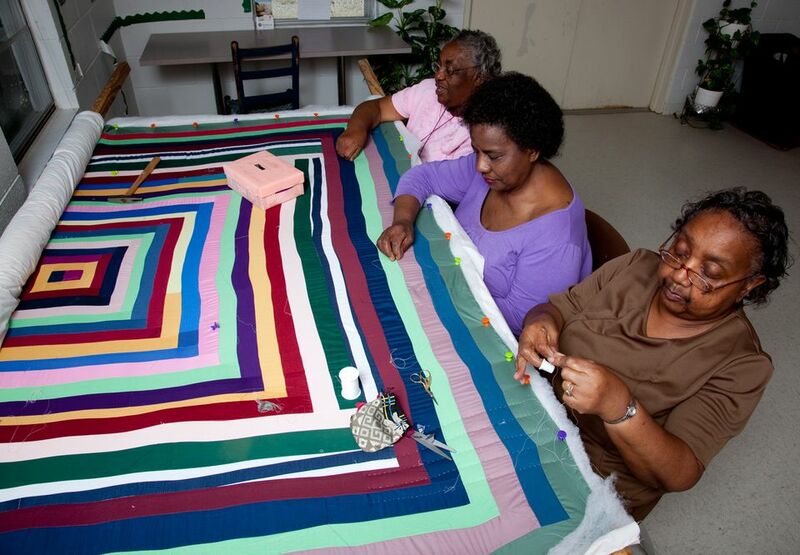 Some of the quilts are indeed made using typical patterns, but many are sewn in colors and freeform styles that are more in sync with the African American heritage of the quilters. The community was once a plantation and has always been somewhat isolated from other areas of the state — only one road leads into the area. The isolation is probably one of the factors responsible for the unique Folk Art look that quilters developed during the past several decades. The quilts of Gee's Bend began to gain recognition in the 1960s, but widespread national exposure didn't take place until about the turn of this century when a group of quilts from many eras became part of a traveling exhibit displayed at museums across the United States. Since then, the U.S. Postal Service has issued stamps depicting Gee's Bend quilts, and today's quilters sell their works and teach the skills to others. Follow the group's Facebook page to learn about upcoming events. Fabric of Their Lives, by Amei Wallach, blends the history of the area and its quilters. Deep South Magazine offers another look at the community in the article The Future of Gee's Bend, by Erin Z. Bass. Don't miss the photos of exhibited quilts. Auburn University's website offers a peek at exhibited quilts. Flip through the following pages of this gallery to view a collection of Gee's Bend quilts, along with a photo from the community's Quilt Mural Trail. Dresden Plate is a popular traditional quilt pattern, but it's not typically stitched in the vivid colors this quilter chose — a lovely variation. At first glance, I thought this floral medallion quilt was embellished with cross-stitch, but after zooming into the original photo believe the embellishment was created with needlepoint. Murals that depict quilts from the Gee's Bend stamp collection were placed throughout the town in 2007 and 2008. Learn more about the Gee's Bend Quilt Mural Trail. This photo zooms in a bit to show a portion of a Gee's Bend log cabin quilt. It isn't a typical quilt made from a series of log cabin quilt blocks — the project was sewn as one oversize square block. Jorene Pettway, shown at her sewing machine. Jennie Pettway is one of the young girls holding the Dresden Plate quilt top in this 1937 photo.